This review was originally published July 2004, the DVD set having become scarce by then. Later, the DVD set was rereleased by A&E Home Video in 2005, then fell out of print again. The complete series set was reissued by Shout! Factory in 2013. 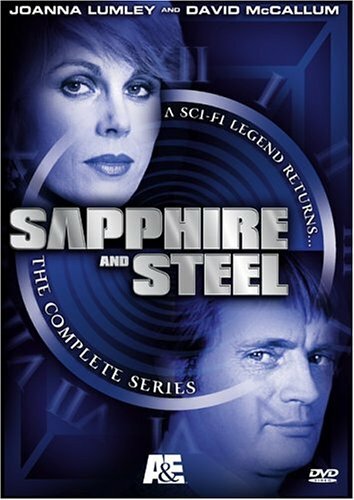 Each adventure is a carefully crafted mystery, building the suspense more through imagination rather than cheap surprises, with Sapphire and Steel using their extrasensory and deductive powers to figure out not only what problem with time exists, but what the objective of changing time might be so they can set things right again. The adventures tend to start out very slowly, but the unfolding of the stories are worth the wait. This definitive set, containing all 6 assignments, totaling 34 episodes and clocking in at over 15 hours, has been remastered for digital transfer. Both the video and audio are crisp, but sometimes the volume is uneven between the opening credits and the episode dialogue. The set is also fairly hard to find. Despite originally being part of A&E’s “Cult TV” series, only one of the major online DVD retailers, DVD Planet, lists the set, and that may be because they’re the last ones with copies in stock. It’s not mentioned in any of A&E’s print brochures, nor is it available from their online shop, which is a shame. I believe this would be a pleasant discovery for a number of SF and mystery fans. partial audio commentary by either writer/creator P.J. Hammond or Producer Shaun O’Riordan, during either the intro or one episode of each adventure; star biographies, and a gallery of stills from P.J. Hammonds’ collection of series press clippings. Personal recommendations: Start with Assignments 2, 4 and 5. Had never heard about this one before, but it defenitly sounds like something I have to check out.